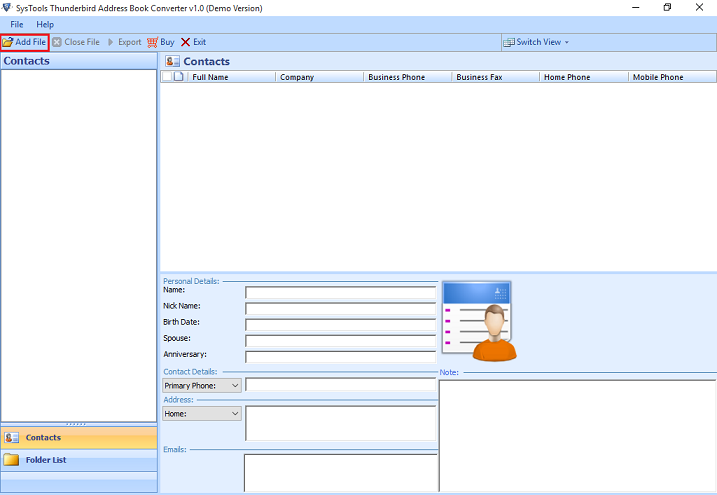 You can organize your contacts on the basis of Full Name, company Name, Business Phone, Home Phone, Mobile Phone and Mobile Phone. You can also Preview and Explore the personal details of the contact such as Name, Contact details, Home address, Office Address and Email ID as well. There is no requirement of Outlook Installation when you just want to convert the MAB file into PST. 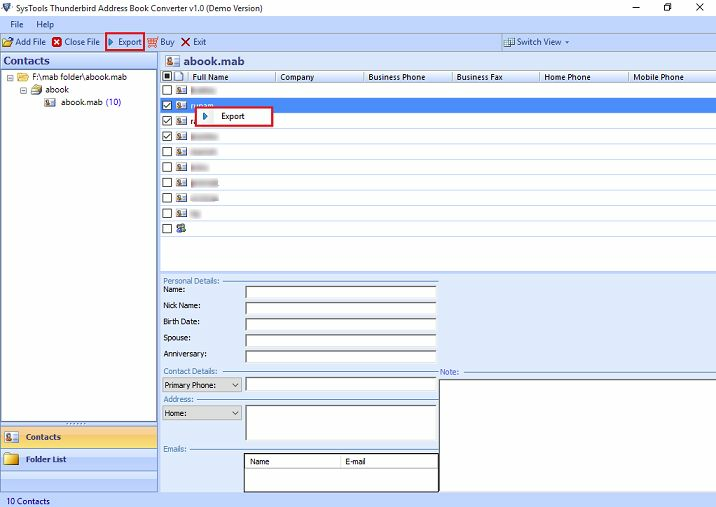 But You will definitely needs the configured Outlook to Export the MAB file directly to Outlook.By default the MAB Converter tool do not requires any Outlook Installation. 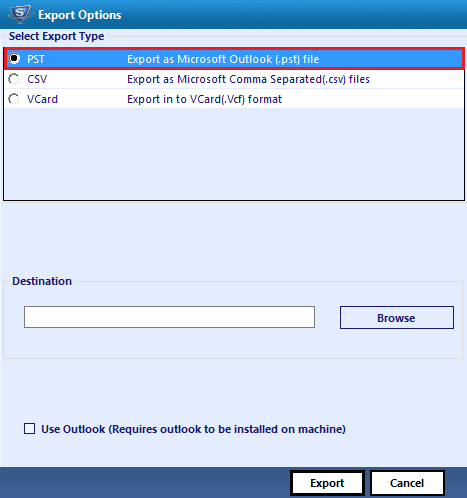 You can select the desired contact for export to CSV, VCF and PST. It provides the option in which you only select the contact which are necessary and need to convert into CSV, VCF and PST format. Once Multiple MAB file can be converted at the same time into single PST File. You can simultaneously convert abook.mab, history.mab and impab.mab into Single PST file. When you want to convert MAB file to VCF then single VCF file is created for each contact. 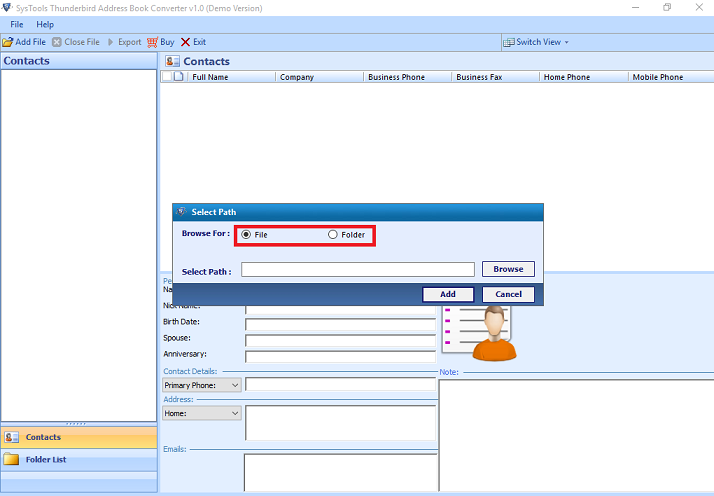 In this way you can save details of each contact separately with complete personal details. It is easy to convert your multiple MAB file contact to CSV using the MAB Converter.CSV allows data to be saved in a table structured format. CSV file can be easily open with any spreadsheet program such as Microsoft Excel, Open Office or Google Spreadsheet. Therefore provides the interoperatibility to the MAB contacts. Demo version of MAB Converter Software allows Converting and saving first 10 Contacts from MAB to CSV, VCF and PST file format. Support: Windows 10, Windows 8 & all below versions of Windows. Disk Space: 5 MB of free disk space. Is Outlook Installation necessary for conversion to PST? 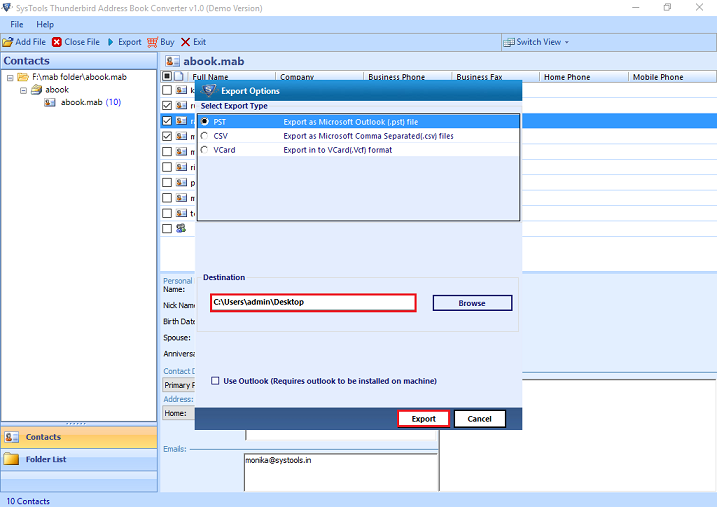 NO,The Outlook installation is not necessary for the conversion to PST but you have to install it when you want to Export MAB file to Outlook directly. What is the file size limitation of MAB file? The Pro version of the software does not impose any restrictions on the MAB file size. But there are certain restrictions on the Demo Version of the software. 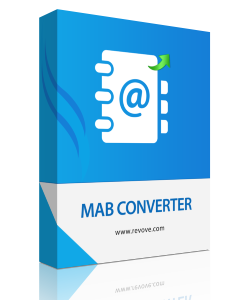 The MAB Converter tool is the tremendous software and works very well as it saves my valuable time and cost. I want to export my Thunderbird Contacts to Outlook. With the support of MAB Converter tool, I did the successful conversion of MAB to PST file. Frankly speaking, It is an awesome tool which I can definitely recommend to other as well. I successfully converted my MAB file to CSV format and all credit goes to the MAB Converter tool. It professionally completed all of its tasks while maintaining the integrity of the MAB file. I am glad to have such a wonderful application. Thank a lot for this nicely innovated professional tool.